I just wanted to share with you an outfit I wore last week. When my new brooch arrived I decided to wear it on my black H&M dress, however this dress is a lot shorter than I thought was even with leggins was indecent for work. 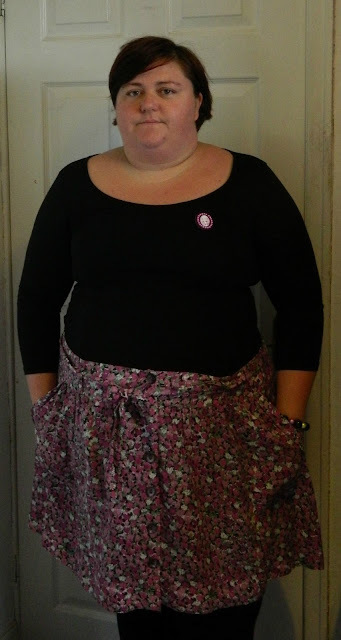 The colours in the skirt match the brooch really well. It was a good idea wearing the skirt over the dress as the skirt is quite see through but it has buttons and pockets. I got the skirt in a 22 as it was the only size I had and its really too big but I'd ripped all the tags off it before I realised.